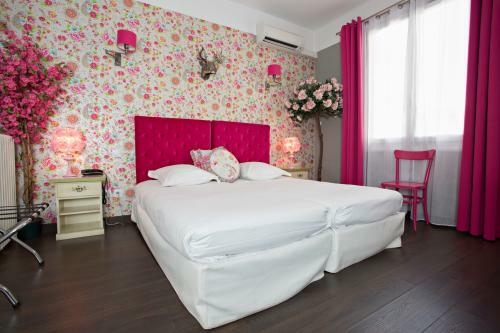 Generous sizes (between 18 and 22 m2) and lovely decors invite reverie and escape for a night or a longer stay; welcome into the enchanting universe of Mademoiselle! A decor to make you feel good, design because you like it, complimentary biscuits (cookies) and a little good humour to top it all off! An exotic or flowered ambiance, each room holds playful surprises, while offering a complete range of equipment and services: LED TV flat screen wide format, French and international channels, Nespresso machine with capsules & kettle with tea, additional pillow and blanket, shower gel & shampoo, free Wi-Fi, air-conditioning, telephone, mini-refrigerator provided, along with hair dryer and electric towel dryer. The must of Mademoiselle! 4 rooms (from 24 to 30 m2) right in the heart of Juan les Pins and only 1mn from the beaches, 4 worlds of invitation to dreams and marvel: the natural, relaxing atmosphere of a recreation of a birch forest, the charm and softness of a romantic room, the very Snow White ambiance of a forest inhabited by dwarfs, or the classicism of a bourgeois room, gently tweaked by a desire for naturalness. Mademoiselle likes decorating and loves receiving you: LED flat screen TV wide format, French and international channels, Nespresso machine with capsules & kettle with tea, additional pillow and blanket, shower gel & shampoo, free WiFi, air-conditioning, telephone, mini-refrigerator provided, along with hair dryer and electric towel dryer. One room is lost in the clouds, another a forest idyll with birch trees and sheep to help you nod off. One is like a weird and wonderful hunting lodge, another seems to be expecting snow-white to drop in at any minute. 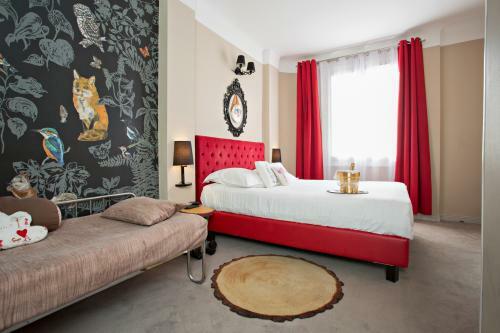 One room could even be Goldﬁngers' home!Mademoiselle certainly has a surprise in store behind every door! And when you wake up refreshed from your slumbers our lovely tranquil terrace awaits you for breakfast in the sunshine.And when spring and summer roll around we open a tea room at Mademoiselle! 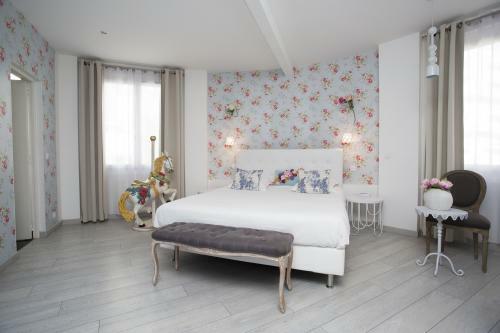 Mademoiselle has found its own sunny little niche between the luxury guesthouse and quality hotel *** sectors. It welcomes guests in the same spirit. One at conviviality, endless respect and a touch of extravagance! So feel free to ask where we found all the little decorative treasures dotted in every room. Mademoiselle is happy to share its deco secrets with you.